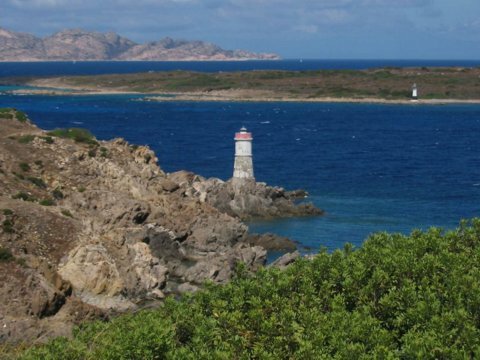 Isola della Bisce is a small island near Porto Cervo. In the photo above, Isola della Bisce is the island on the far side of the channel (Passo delle Bisce), with the white light tower with a black stripe. Photo 2 is a closeup of that lighthouse. 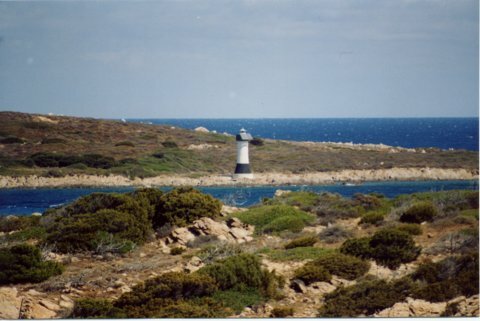 Both the light on Isola della Bisce and Canale della Bisce (the small beacon in the foreground) mark the passage between the mainland of Sardegna and Isola della Bisce. Beyond this I cannot find any information about these two beacons. Once there you should ask where Isola della Bisce is. My maps aren't detailed enough to give directions beyond this.